This plastic clutch is by Carlos Falchi. 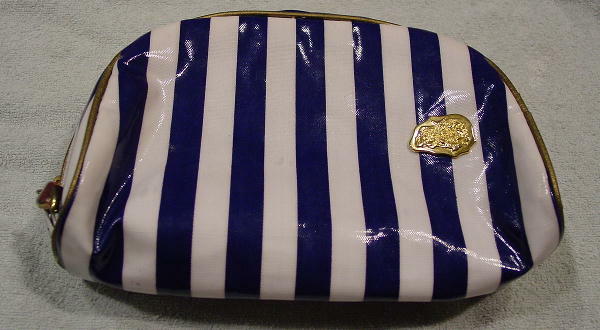 It has alternating dark blue and white vertical stripes and a bottom side to side zipper. There is a gold-tone metal Carlos Falchi ornament on the front and a gold-tone freeform heart on the zipper pull. 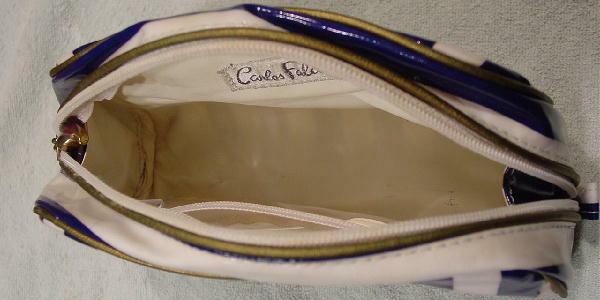 The interior is white plastic with a fabric tag on one side that says Carlos Falchi (R) and a full-side clear plastic zipper compartment. The bottom has a couple of small spots where the white has worn off the lining.